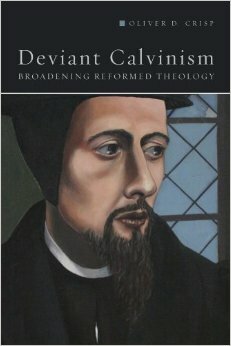 I’ve already written about it once before, but one of the more interesting books I read last year was Oliver Crisp’s Deviant Calvinism. As I said there, Crisp aims to show that, contrary to popular perception, the Reformed tradition has been much broader and contained greater theological diversity than is commonly thought. This broadness was not a bad thing either. It’s not that we just hadn’t figured things out yet in the past, but rather that this diversity is a healthy, important feature of the Reformed tradition that needs to be recovered for its well-being and vitality. In a sense, he wants us to remember that “always reforming” is a necessary part of the Calvinist theological ethos. In order to do so, Crisp engages in a number of studies of retrieval theology, examining marginal or “deviant” positions within the tradition. I’ve been happy to see the way the book has sparked quite a bit of interest online through posts and reviews, some critical (apparently Roger Olson is miffed that Crisp sounds too much like a Calvinist…) and others quite positive. One issue though, that merits a bit of explanation or clarification is that of Crisp’s intention and method, as I think there has been some confusion on this point. Crisp engages in a mode of theology that has been gaining in popularity recently, which has been termed “analytic theology.” Essentially, some theologians and philosophers of religion have been appropriating the insights of Anglophone analytic philosophy and applying them to mainstream theological discussion. So, whether it’s a matter of using more precise, contemporary modal logic, or using some of the epistemological insights of Alvin Plantinga for the purposes of theodicy, analytic theology chooses different philosophical conversation partners. It also adopts a mode of argumentation that prizes clear, conceptual definition, extended analysis of just what issue is up for grabs in any given argument, and logical rigor. Contrary to some rumors, from what I know of analytical theological types this isn’t out of some “rationalistic” impulse to systematize the faith into some easily graspable construct either. Many simply want to get back to the days when theology actually tried to ask and answer questions with care and clarity. Given my undergraduate background in philosophy at a school that’s got a bit of an analytic bent, reading Crisp’s work took me back to the old days. I suppose that’s why I was unfazed by the one feature of Crisp’s work that has been causing readers some trouble: his tendency to argue for a number of positions that he apparently doesn’t hold, or at least gives no indication that he holds. For instance, in one chapter he argues that the Westminster Confession is somewhat metaphysically underdetermined and so it is possible to believe in a form of Libertarian freedom consistent with Calvinist soteriology. Or again, he argues that views like eternal justification or justification in eternity don’t necessarily have the antinomian tendencies or corollaries that many have accused it of, and on that score it more consistent with mainstream Calvinist orthodoxy than is supposed. To my knowledge, Crisp doesn’t actually hold any of these positions. He’s simply clearing some elbow room in the tradition to say that these aren’t necessarily heterodox opinions to hold. Now, to many, this might seem like an odd, counter-intuitive, and quite distracting theological endeavor to engage in. Why argue in favor of positions you don’t hold? Why defend what you may end up ultimately discarding? I see two motives, one stemming from his analytic bent, and a second from basic Christian theological conviction. 1. Clarity. In the first place, I see this as a feature of his analytic pursuit of clarity bleeding through. I recall one important article on the problem of evil by Stephen Wykstra taking a significant amount of time to defend a position against two critical articles, only to then turn around and offer a third argument against that very same position. Taking the time to rule out bad arguments against positions you don’t like, or even ruling out bad arguments for positions you do like, clarifies the discussion at hand. Clearing out bad arguments narrows the field of discussion and un-muddies the waters so real dispute can take place. Alvin Plantinga does this sort of thing all the time. For instance, some have rejected Calvinism or Augustinianism, because they have been turned off by the very common argument made by many Calvinists that the sole, or chief end of God in election or reprobation is the glory of God in the public display of attributes. Crisp argues, as Bavinck did before him, that if that argument proves anything, it proves too much and works much better for Universalism. Now, that may seem like a blow for many Calvinists looking to uphold Reformed theology. Instead, it can be seen as an opportunity to drive us back to clearer scriptural and exegetical arguments. In other words, getting rid of an argument that doesn’t work actually helps your case by not allowing your interlocutor to be distracted by the bad argument and forces them to face your better ones. Or, again, dispensing with bad arguments against positions you don’t hold allows you to focus on the arguments that actually do work. 2. Charity. The second reason is a bit more straightforward. Christian charity ought to motivate us to fairly represent the positions of those we disagree with in the best light possible, before disagreeing with them. It is a form of loving our neighbors as we love ourselves in the intellectual life. If we love someone, we don’t lie about them. We try our best to tell the truth about them in all areas. Showing that a position wrongly advocated by a brother does not necessarily entail or lead to antinomianism or something of that sort, is a form of truth-telling. As always, there’s more to say here, but I think a couple of these concerns are at play in Crisp’s work. So yes, while it may seem a bit counter-intuitive and confusing to devote lengthy pieces of work to defending positions you don’t actually hold, I think there is an important place for them in public theology because there ought to be a place for clarity and charity in our work of elucidating the truth of God for the sake of the Church.